For a long while now, if you are an early adopter of technology, Google Chrome was the place to be. You could always download the current release version, but if you wanted to live on the edge a little bit, you could install the beta version. The beta version offered features deemed not quite ready for the stable release version, so could likely crash more often, and was not recommended for production environments. If you were even more gutsy, you could install the development version, which in effect was two releases away. So, if the stable version was Chrome 9, the Beta version would be Chrome 10 and the Development version Chrome 11. Firefox users wanting a rougher, new-features-the-second-they-arrive version, haven’t been so lucky. You could always downoad Minefield, the in-progress beta version, but there wasn’t anything official. Until now. Mozilla, the organization behind Firefox (and the Thunderbird email/news client), recently unveiled its three-prong development model, which mirrors Chrome, quite closely, although it does use slightly different terminology. The stable version will always be just that, Stable. Currently Firefox is sitting at version 4.0.1, and if you download it from mozilla.org, that’s what you’ll get. If you want the newer versions, however, read on. Point your web browser of choice to this address, to see the in-progress versions of Firefox. Beta will always be one version number higher than the stable release version, which means that currently, Firefox Beta is at version 5.0 (beta 2). It is a fairly stable version with a lot of the new features already in place and stable enough for everyday use. You’ll likely find that a lot of your favorite extensions haven’t been updated for it, but some will. Installing the Beta version (and Aurora, for that matter), is a simple matter of scrolling down and clicking the big blue Download button. Once your installer downloads, you’ll install it just as you would any other program on your operating system. This will vary from Windows to Mac to Linux, of course. Windows users will install an .exe file, Mac users get a compressed disk image (.dmg), while Linux users get a tar.bz2 file, which can be extracted and run from source. Note: Ubuntu users now have a PPA available here. 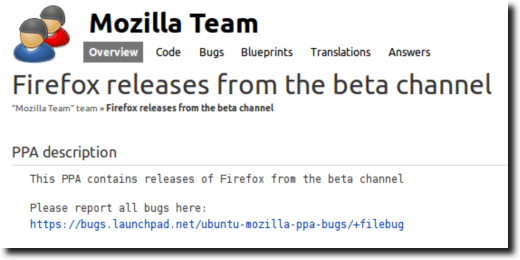 What can you expect from the Firefox Beta? Surprising, a pretty smooth ride. Aside from the extensions you may rely on not being “ready” for the upcoming version, the Beta has seemed very solid. You’ll notice a Feedback button, located to the right of the Search Box. This is standard for the Beta version (and Aurora), and is helpful for those times you do experience a crash. Note: if you don’t like the feedback button, you can remove it from the toolbar, just like any other customizable button, or disable the extension altogether, from the Add-ons page. The Aurora version, as opposed to the Beta version, is sort of a moving target. Whereas the features you experience in the Beta version are practically guaranteed to eventually show up in the stable release version, such isn’t the case with Aurora. The Beta version is designed to smooth out rough edges, and make what’s already there even better. Aurora, on the other hand, is more of a testing ground. A feature you see one day could potentially be gone the next, and you should expect a lot of breakage, as well as some weird behavior. 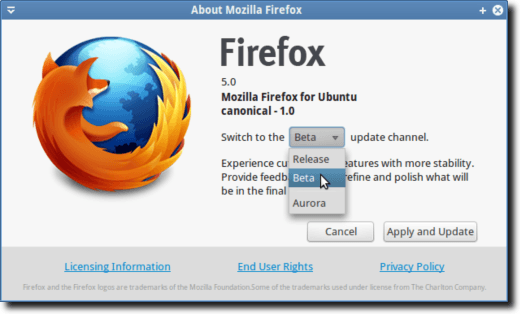 Installing Aurora is just the same as installing the stable release version of Firefox or the Beta version. Scroll down the Future Releases page until you see the purple Download button, and click. You’ll again download the .exe, .dmg or .tar.bz2 file, depending on your platform. This time, however, Ubuntu users have no PPA option, as it’s been deemed too much work by the mozilla team’s Ubuntu PPA group. Additionally, something this rough probably shouldn’t be tried out by someone not confident enough (or competent enough, for that matter), and with experience with alpha/beta software. All in all, this is a pretty nice development for Firefox users. As Google Chrome users have seen, simply because a release isn’t the stable release doesn’t mean it isn’t actually stable during everyday use. And the same can currently be said about the Firefox Beta series. In spite of it not being the stable series, it’s been very stable, “feels” a bit more responsive (a rather subjective feeling, of course), and looks and behaves nicely on every website it’s been thrown at.